The Troy Bilt TB220 High Wheel 3-in-1 Self-Proppelled Lawn Mower operates with a powerful 159cc OHV engine and will accommodate small to medium size yards. This mower is self-propelled and equipped with front wheel drive. The smarter tire design, 8" x 11" front and rear tread wheels, and comfort grip handle provide more confident handling and traction for any terrain. The TB220 cutting and mulching deck grass height settings range from 1.25-3.75 inches and provides 3 options for you to select your desired cut for either mulching, bagging, or using side discharge with an included standard 1.9-bushel grass catcher. This specific model comes equipped with a TriAction cutting system engineered to deliver a clean, even cut in just one pass. 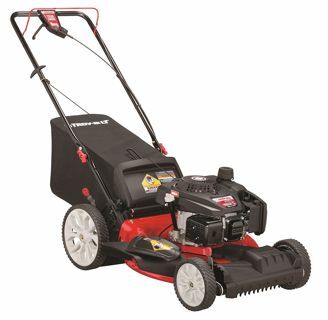 Troy-Bilt offers a 2-year limited warranty on the TB220.